Taupe suits can add a little bit of spice to your wardrobe colors. It’s a interesting look between the darker conservative looks and the lighter summer shades. As with most colored suits, these should not be a first suit selection. Stick with your basic navy blue or grey. One issue that you can get with taupe is that there are many different shades. A common definition is a creamier or whiter version of tan. However, some other people consider it more of a grey-tan. You might also see it called fawn, which I’m not a big fan of personally but it’s good to know. In any case, it’s usually a lighter brown shade. A chocolate color might be called dark taupe. Sometimes, it can look like there is some grey mixed in as well. It’s not a color that looks good on all guys, and can tend to make you look a little washed out depending on your skin tone. 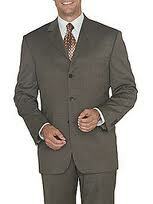 However, it can work in a more casual environment, or for a lighter wear suit for weddings or parties, for example. A lighter shade can look like a more summer or lightweight suit. It’s a very nice look for a cotton or linen blend. Wool can tend to look a little unbalanced, in my opinion. A lighter look like this tends to wash out in winter gray. Gabardine can also be a good fabric choice, but it may be a little warm for summer wear, but for spring or fall it can work. As far as matching, a nice pink shirt and patterned shirt can look sharp with this. I’ve also seen some nice blue patterned shirts, with a solid dark tie. You can try a white shirt and tie combo but it tends to wash out the face. I think some color is needed there.